Every woman wants to have beautiful, perfectly styled hair every day. Women use color services, chemical perms and straighteners, heat styling, and hair-styling products to keep their hair looking great. Unfortunately, these tactics often backfire and the result is frizzy, broken hair that looks dry, damaged, and dull! Even the sun can create these damaging effects. Most women long for a solution, spending tons of money for reparative treatments to restore the luster of their locks. The great news is that damaged hair can be restored using an affordable, natural solution with Visible Science Organic Argan Oil with Resveratrol! This incredible product can help bring back hair's vitality and creates shine and softness. How does Visible Science Organic Argan Oil Work? The hair shaft is made up mainly of proteins and keratin, bonded together to form smooth strands. Over time -- especially with the use of chemicals, dyes, and heat styling -- these bonds become weak and break, leading to frizz, dullness and split ends. When heat is applied to hair, the effects can be immediately noticed and often, the damage is considerable and difficult to repair. Visible Science Argan Oil uses the powerful conditioning and antioxidant effects of Organic Argan Oil and Resveratrol (high in antioxidants, proven to reduce the effects of aging and restore skin and hair), along with Carrot Seed Oil (known for its nourishing and reconditioning effects), Haematococcus Pluvialis Extract (an anti-oxygenic that helps to protect hair from UV damage) , and Linseed Oil (a great source of Alpha-linoleic Acid similar to the Omega-3 fatty acids), to infuse vitamins and moisture into the hair shaft. When applied to damp hair before styling, Visible Science Argan Oil not only helps to restore hair's sleekness and shine, but also provides protection from further damage due to heat and sun exposure. It can also be applied to dry hair to create shine and smoothing effects. Why Choose Organic Argan Oil? Many people choose to use organic products and consume organic foods because they promise purity and quality. The same concept applies to using organic Argan oil in your hair, such as Visible Science Argan Oil with Resveratrol. Organic Argan Oil absorbs more quickly into the hair, and doesn't leave any greasy residue behind. The result is soft, clean-feeling hair that is able to reap the benefits of this powerful substance without any additional chemicals or additives. Visible Science Argan Oil's benefits aren't limited to just restoring and repairing damaged hair. The potent ingredients in this product can also deposit their vitamins and antioxidants into skin, providing moisture. Argan oil is commonly used to help heal several common skin conditions like acne, dryness, and flaking. Because of its powerful benefits for both skin and hair, it can be applied everywhere, including the face. In addition, this is one of the few hair care products that won't negatively affect your skin. The high antioxidant content in Visible Science Argan Oil with Resveratrol can help reduce the effects of aging on the skin, promoting a vitality and glow wherever applied. Acting as a skin and hair moisturizer and slowing the effects of aging, Visible Science Argan Oil gives you the benefits and effects of several products with the use of just one! Is Visible Science Organic Argan Oil more effective than other products? 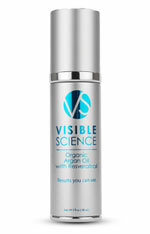 Visible Science Argan Oil is definitely more effective than other hair care products! Using a combination of powerful, organic ingredients, the benefits and safety exceed expectations. Taking the place of several products -- including moisturizers, conditioners, detanglers and hair styling products -- Visible Science Argan Oil with Resveratrol is an all-around workhorse for moisturizing and restoring your skin and hair. We highly recommend Visible Science Argan Oil for anyone looking to condition, restore, and repair their hair and skin. Due to its high effectiveness and powerful ingredients, users report great results. Click here to try Visible Science Argan Oil with Resveratrol today and give your skin and hair what they need to feel and look beautiful! Visit our Q&A page for tips on dealing with split ends, frizzy hair and other hair care catastrophes.